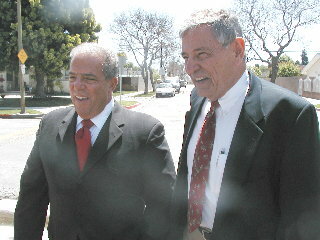 (April 17, 2006) -- Less than a week after finishing third (roughly 19.3% of the vote) to Frank Colonna (28.3%) and Bob Foster (48.4%), retired Councilman Doug Drummond today (April 17) endorsed Mr. Foster for Mayor. The announcement came at a midafternoon press event attended by both men in a 3d district neighborhood near Kettering Elementary School. The street included what Drummond called "pension potholes," a jab he frequently made during his campaign in pointing to Colonna's 2002 vote (part of a 9-0 Council action recommended by former management) boosting pensions for non-public safety employees. LBReport.com posts extended transcript excerpts of the press event below, along with reaction from Foster's opponent in the June 6 runoff, Councilman Frank Colonna. 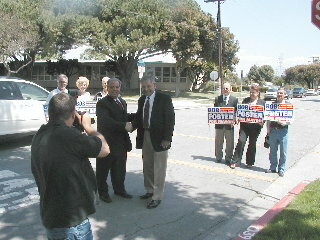 A press photographer snapped photos of Messrs. Foster and Drummond shaking hands as of some of Drummond's former campaign workers held Foster for Mayor signs in the background. Mr. Drummond: ...See, everything right up the street still bad [broken parts of street surface]. It's pension potholes all over the city. That's what we have, because basically Frank was part, a big part, of voting for the pension spike that destroyed the budget. Now, we have pension potholes and the children in this school don't have the library hours on evenings and weekends that they need. 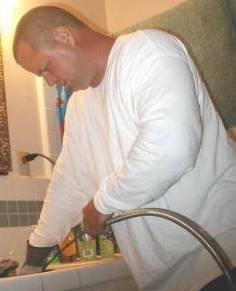 And I think that the only guy that can fix it is Bob. He has the background in big business to get his arms around it. He also knows how to bring people together. And you know what? He has the character. And the pair shared a hearty handshake. "Doug's endorsement doesn't surprise me. I believe a majority of Doug's supporters don't agree with Mr. Foster's special interest agenda. I'm determined to work hard to represent all of Long Beach and look forward to the upcoming runoff election." We asked Councilman Colonna about a statement in a Foster campaign release (distributed at the press event) which noted Mr. Foster had carried Councilman Colonna's 3d Council district by 13 percentage points. Councilman Colonna's comment: "That was with two current or former 3d district Councilmembers in the race." Mr. Foster: I'm honored to have Doug's support...I think he's a man of honesty. He's a man of character...His honesty, his straightforwardness, he tells it like it is. You always know where he is and I really appreciate that. He was just somebody who talked about issues. We had a lot more in common than what separated us, and I'm very proud to have his help...and I think Long Beach will certainly benefit from his continuing to stay active in the city. [Q & A} LBReport.com: You said during the campaign [cites a Drummond campaign statement from February] "A large percentage of contributed money is coming from outside the city from special interest groups comprised of people who can't vote in our elections." And then you said, "The recently filed campaign financial statements are evidence special interest groups are actively involved in our race for Mayor. Monies contributed cause an imbalance on the playing field." To whom were you referring when you mentioned that and how is that consistent with what you're doing now? Mr. Drummond: I was referring in that to Bob and to Frank. And you know, I'll tell you something. You still look across and you look at the Long Beach contributions. You look at the people that are involved, and he was able to bring 'em all together and find the funds. And with this world that we live in, you can't deliver the message unless you have the funds. LBReport.com [to Mr. Foster]: Can I follow up with you for a second? LBReport.com: The first press release your campaign sent out in June or July of 05 was about the money you'd raised in the first half of the year, that was before you did your [candidacy] announcement in September 05. If your campaign made money the issue then, why isn't it the issue now? LBReport.com: ...with the press release. Mr. Foster: [politely] Hang on, Bill. We started out late. You know that and I know that, because Randal Hernandez was in the race at that time. He started very early. He had a finance committee put together. I had to do several things, get an exit agreement done and all things at Edison and work out a transition. We announced relatively late, and we really went out and raised funds very quickly, so that's what was news then. Look, we know this is an issue, and I keep saying this: go look at the contributions. We raised more from Long Beach than anybody else. 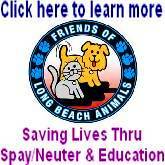 We've raised more from Long Beach than Frank Colonna has totally raised. So we can make this an issue or not. The real issues in this city are public safety, budget deficits and how we fix our fiscal problems, the Port, the asset that it is and the environmental problems that it causes and how to clean that up. And overarching everything is to bring economic hope and real opportunity to people that don't have it. Look, we're starting to see graffiti in neighborhoods like this. We starting to see graffiti in other parts of this city. It's illustrative of what I'm saying. You cannot be safe unless you provide real opportunity to people that don't have it now. That's what is at the root cause of a lot of this stuff. We have to do that here. So we can have all these side discussions and distractions about who raised what and where. That's fine, that's fair game, but let's also talk about what's important to this city. I'm dedicated to that and I'm passionate about it, and I'm happy to have Doug's help because Doug is the kind of person I like. He's straightforward, he says it the way he thinks it, and I am proud to have his support. 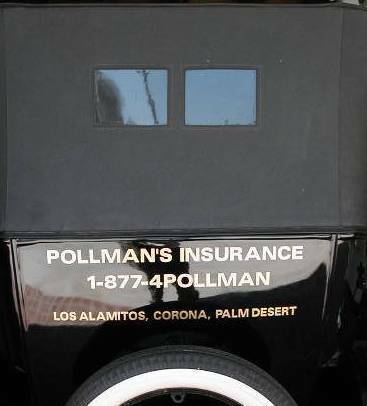 So...was this the last campaign for Doug Drummond? "Yes," he said with a smile..."but you'll still be hearing from me." 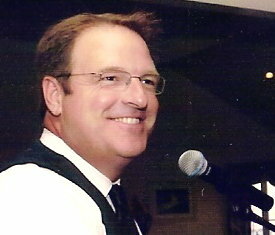 Long Beach Mayoral Candidate Bob Foster will report raising $157,033 for his mayoral campaign in just 27 days. Foster, running to replace retiring Long Beach Mayor Beverly O'Neill, collected the 324 contributions in just under four weeks. "This is unprecedented in a Long Beach Mayoral Campaign," said Larry Uyeada, Foster's finance chairman. "It not only shows the depth and breadth of Bob's support, but especially the confidence of his peers in his ability to govern. 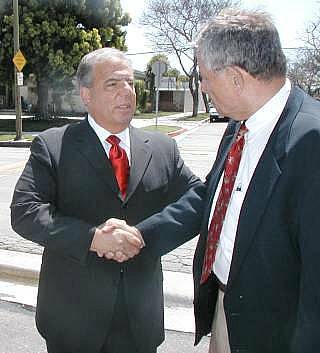 His widespread support is testimony to the resources he can bring to the office of mayor, and to his ability to get things done for Long Beach." A decade-long resident of Naples in Long Beach, Bob Foster is currently President of Southern California Edison. 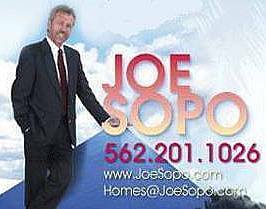 Foster has a long and distinguished resume including extensive experience in state government, is a trustee of the California State University system, and serves on many local boards including the Long Beach Aquarium and the advisory board of Miller's Children's Hospital. Foster attributes this long record of public and private service to the overwhelming reaction to his campaign: "I am honored and humbled by the response of my friends and colleagues to my candidacy," he said. "I hope to bring my experience in the public and private sector to my hometown, and use the contacts and relationships I've forged over the years to truly make Long Beach an even better place to live and work."